I’m afraid I might have to stop shopping at Tesco Metro. I enter the store pumped for new groceries and leave in a stressed, frazzled state. That shouldn’t happen while grocery shopping. For starters, the store itself is stress-inducing. Whoever designed the store did not count on anyone using a shopping cart or there ever being more than five people in the store at once. There are pillars, displays and storage carts in the middle of almost every aisle, making it impossible for more than one cart to fit through at a time. The aisles are so jam-packed that you can never stop to contemplate a purchase. You have to grab the item while still maintaining a steady speed so as to not create a backup. It’s like driving around looking at Christmas lights — you can slow down, but you can’t stop or people will honk. If Tesco insists on offering giant shopping carts in their tiny store, they should install horns on them. Nothing jolts an oblivious aisle-blocking stroller-toting mum like a good honk. The store designer also did not count on there ever being more than two people in line at each check out (or “more than two people queued up at each till,” if I must Britishize it). If there are more than two customers, they stretch out into the aisles, making it difficult to cross the front of the store or to go down an aisle. No one likes to leave a gap for fear of someone cutting. Yesterday was so bad that I actually would turn my cart around and backtrack down an aisle towards the back of the store just to avoid crossing the lines at the front. Don’t people have better things to do on a Thursday morning than hit up Tesco? The store is also in a bizarre location. It is called the St. John’s Wood Tesco Metro, but it doesn’t feel like St. John’s Wood. Someone on Twitter described the SJW neighborhood best: “Stunning houses, wealthy Americans, lots of dry cleaners but lacking in pubs.” It is also lacking in grocery stores, likely because all the “rich Americans” use delivery services (my refusal to have my groceries delivered is material for another post). The minute I hit Church Street it’s like I’m in a different ‘hood, a different country almost. There’s always a Middle Eastern-esque street market going on. They have your usual street fair items — fresh fruit and vegetables, jewelry, knock-off handbags and suspiciously cheap clothing. But there are also some really bizarre items, like duvets and small household appliances. It’s weird. “Hey, where’d you get that crock pot?” “Just down the street — literally.” There’s also always a strong incense aroma in the air. This is what I lug my shopping trolley by every time I’m craving Tesco-brand orange-mango juice or mushroom sauce. I really wish I could commit to a grocery store and become a regular shopper. But there are three different stores within a mile and a half of my flat, and I like things from all of them. I go to Sainsbury’s for most items, but Waitrose has the best salad dressing and croutons. 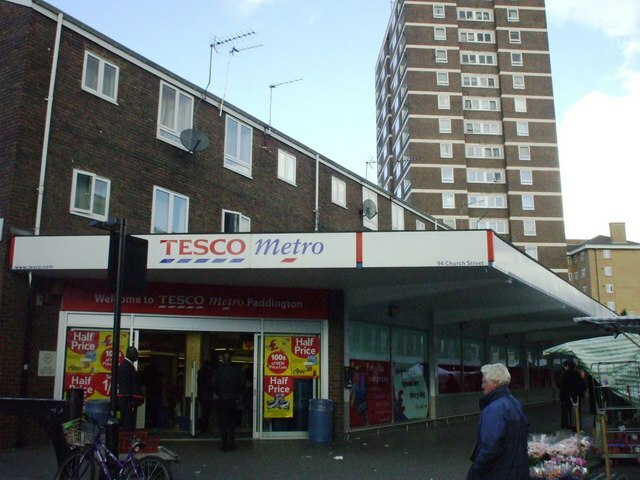 Tesco Metro has better ready-made meals and the mushroom sauce I like to eat with gnocchi. Of course yesterday they were sold out of it. That also contributed to my stress — lugging my shopping trolley over a mile for a certain item to find out it was out of stock. I also went because they were having a 3 for 2 sale on cereal. My family is coming in two weeks so I thought I should stock up on my some breakfast items. I have eight boxes of cereal now. I may have taken that too far. In short, I wish I could quit you, Tesco Metro, but your prices and mushroom sauce may just keep me coming back. Perhaps I’ll make the journey worth it next time and pick up a nice £1.99 jumper (that’s British for “sweater”) or rice cooker from a street vender. Few things scare an American more than a foreign phone number. I should know — I have one, and it still scares me. I’ve had it for months now and still haven’t memorized it. It’s quite awkward when I call to make a dinner reservation and have to say “Um, hold on…” when they ask for a phone number, then have to frantically look it up in my email. To Americans, foreign numbers seem to go on for ages. My UK mobile number is 11 digits, only one more than my US cell number, but it might as well be 20. I guess when calling from the US you have to dial 011, the international access code, then 44, the country code, then 20 the London area code, making my 11-digit number 18 digits. But I also think it’s because American numbers are so neat — (555) 555-5555. It doesn’t seem like 10 numbers, it’s three numbers, which are the same for everyone in your city, then three numbers followed by four. That makes it easier to digest than 08456027281, which is the number for Argos direct. I just received a voicemail from them requesting a delivery date for the guest bed I ordered. I was impressed that the man pronounced my last name correctly in his Irish accent, but he rattled off the phone number like he was being charged by the nanosecond. I had to replay the message not once, not twice, but four times in order to take the number down. I noticed most people in Britain do this — they leave their number in a voicemail almost as an afterthought and rattle it off as if you should know it. They don’t pause anywhere, it’s just a string of 11 numbers said as quickly as humanly possible in an accent I’m still working to comprehend. If my voicemail did not have the option to repeat multiple times, I would never be able to call anyone back. That is not a pickled cucumber, I have no idea what that stuff is. So I headed to the store to find whatever-the-English-call-pickled-cucumbers myself. 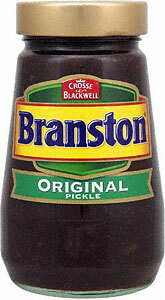 Americans love pickles, but apparently they are not as popular in the UK (like tortilla chips?). I found a small shelf of pickles, all called “gherkins.” Which, of course, made me crave my favorite type of pickle, sweet gherkins. 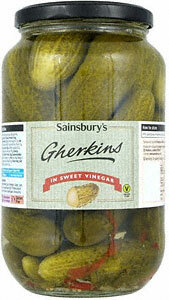 So I bought a giant bottle of these, gherkins in sweet vinegar. Because that’s what sweet gherkins are, right? Maybe I should pick some up next time … or not. It’s been a while since I’ve written about a random people encounter. This evening I was walking home slowly behind a guy wearing a backpack (I’m sorry, “rucksack”) with a flashing red light. I could have passed him, but since I was walking alone at night, I liked having him near, just in case. It was extraordinary quiet; if there were crickets out, I could have heard them. …And then the guy “ripped one” … full blast. The sound echoed and reverberated across the buildings and trees. I wondered why he made no attempt to stifle it or speed up. Then I realized he had headphones on, meaning a.) he had no idea I was walking behind him and b.) he had no idea just how loud his little toot was. And thus ends my first post about a fart. I was going to post about Valentine’s Day in London, and how these cute kids at recess at the school across from our flat clung to the fence and shouted “Happy Valentine’s Day!” to everyone who walked by, and how the Tube was not so much full of couples going out, but guys carrying bouquets of roses to their sweeties at home. But then something far more exciting happened today. I was taking the Tube to go meet Stephen for a nice dinner. As I swiped my Oyster card to exit the station, a guy swiped his to come in and then … he wiped out. He completely ate it; he went down on all fours as if someone put a purple banana peel underneath him. His feet nearly slid into mine, almost causing a domino effect. I looked down to see what could have possibly made this 40-some-year-old man take quite a spill. And then both of us walked off. So to all you single (or taken) people out there who think Valentine’s Day couldn’t be worse, it could — you could slip on a sandwich and fall down in a crowded train station. In yet another desperate attempt to get my English-speaking mouth to form sounds it isn’t capable of making, I started my Rosetta Stone Chinese lessons again. I studied Chinese for two quarters in college and did several months of Rosetta Stone last summer, but I’ve since slacked off. It sounds so easy in principle — “I will do a couple lessons a day,” I tell myself. “And then I will be fluent in Chinese.” Well, it turns out it is not that easy. My first problem are the tones. Mandarin Chinese has four tones, meaning “ma” said with four different intonations means four different words, probably more. To the non-Chinese speaker, the tones are hard to distinguish. So I’ve got that problem. The other problem is the sounds themselves. Pinyin, the romanization of the Chinese characters, makes the words a little easier to distinguish, but there are still sounds in Chinese that we can’t spell with 26 letters. For example, the pinyin “he” is not pronounced like the English third person masculine singular pronoun, but rather like “huhhhhh,” like the noise you make when you lift a really heavy box. 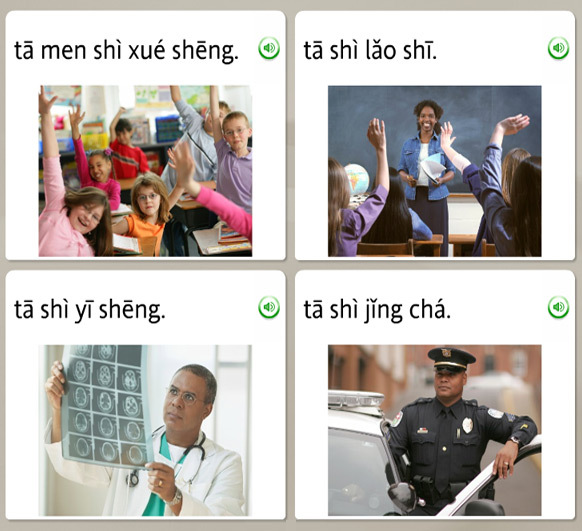 My final problem lies with Rosetta Stone itself. The system of teaching is nice, but I can’t understand why they choose to teach words and phrases in the order that they do. So far I have learned how to say “The horse is running,” “I am wearing a suit but not a tie” and “This is a cat.” When am I ever going to use any of those phrases in China? I would guess that most people who are learning a foreign language hope to one day travel to where that language is spoken. With that in mind, I propose Rosetta Stone offer a new “emergency language” lesson. For China, at least, important phrases would include, “Where is the bathroom?” “Do you have a non-squat toilet?” and “May I have a fork instead of chopsticks?” There could also be a lesson about bargaining, in which it could teach you how to say, “That model of the Bird’s Nest is certainly not made of solid gold like you claim, and is worth 50 yuan at best, not 500.” Those kind of phrases are useful in China, none of this “The man and woman are eating sandwiches outside,” crap. Who eats sandwiches outside in China, anyway? “The man and woman are eating cheap noodles from a questionable cart outside,” would be more realistic. I guess my final problem lies with myself. I can understand when the waitress asks what I want to drink and know how to respond with “bottled water,” but I’m always afraid I will use the incorrect tone and it will come out “monkey blood” or whatever “ping sui” with the wrong tone means. I need to be confident in my rudimentary Chinese. Until I can practice in China for real, I’ll be sitting here telling my computer about the boy eating the apple and the woman running outside. When I was growing up, I had an unusual favorite dinner. It wasn’t pizza, hot dogs or breakfast-for-dinner like most kids love. My elementary school-self loved Ragu’s creamy mushroom Chicken Tonight. The stuff was like cat nip to my untrained palette, I couldn’t get enough of it. No matter how badly my day was going, I would perk up when I saw that blue-topped jar sitting by the stove. And then a terrible, horrible thing happened. Our local Kroger stopped selling the mushroom flavor. I hoped it was merely sold out, but when a different product took its place on the shelf, my hope waned, but was not entirely lost, at least not yet. We found out Remke, a more expensive, further-away grocery store still carried it, so whenever my mom was out in that direction, I would beg her to pick up a jar of Chicken Tonight. It didn’t last very long though. For some inexplicable reason, Chicken Tonight was discontinued. It was a sad day for my childhood. My mom tried to make me feel better by trying to replicate the dish with cream of mushroom soup, but it was not the same. I felt like chicken tonight, but it was nowhere to be found. That glorious creamy mushroom taste was just a fond childhood memory … until two days ago. I was on My Supermarket looking up (what else) tortilla chips, when I wandered into the dip/sauce section in search of some unnaturally neon orange cheese. Instead I found something much more delicious — Chicken Tonight. I did a double take. It was in a green jar instead of blue and made by Knorr instead of Ragu, but it looked like the same stuff. According to Wikipedia, Chicken Tonight was launched in the US in 1990 and 1993 in the UK and still widely available in the UK. That night I told Stephen I would be cooking, which in our household means using the stove (or “hob” as they call it here) to heat up food instead of the microwave. 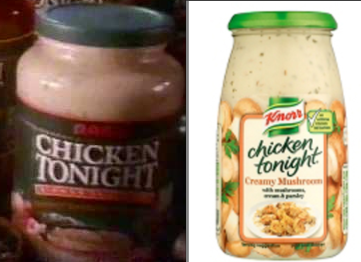 I browned the chicken and mushrooms until I could no longer take it — I opened the jar and stuck my finger inside. It tasted like … well, cold creamy mushroom sauce. There were no fireworks like I was anticipating, but I also didn’t gag. Eventually the dish was complete and I took a bite. I burned my tongue, but it tasted like … memories. I often associate smells with memories, but this was a taste memory. Was it the most delicious thing I have ever tasted in my life? Well, no, I’ve lived a lot longer than my 8-year-old self had. But it was good. Stephen also liked it, so I think it might make it into the dinner rotation. And now that I know my stove/hob works, I can call it a first step towards actually cooking.